The topic is quite commonly asked by the webmasters. 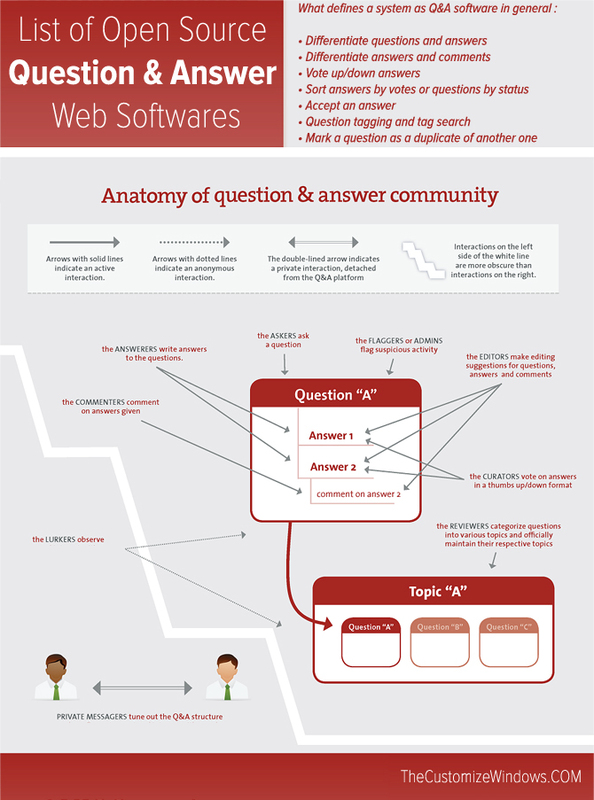 Here is a List of Open Source Question and Answer Software, Better Known as Q&A software. Most Are Standalone PHP MySQL Web Software, Some Are Simple WordPress Plugins. Some of these are exactly like Quora, some are like Stack Exchange, some looks quite different. Since there are many dedicated Q&A sites emerged as multi-million dollar businesses (literally), such as Quora, StackExchange, Yahoo! Answers, it is probably practical to list few Open Source Question and Answer Softwares. We are not going to list a huge number of web softwares. Forum softwares are Gold Standard for creating a community. Question and answer software is best suited to give your visitors the option of posting questions, which can then be answered by you, or other website visitors. It is great like separate comment system. Q&A system is focused on solving problems unlike forums where a long discussions and exchange of opinions can take place. On the Q&A sites, a newbie user asks a question that needs a solution and the other users with an expertise to help solve that problem. The answers are rated, the best get rewarded and is highlighted. When the solution is reached the question can be closed. Q&A software is more user friendly in the sense as the best answers are highlighted, the question has a status that indicates whether it is solved or not and there is no threaded discussions. Question and Answer Softwares are more for odd new users seeking a quick fix. If you run a website for a product or service, a Q&A section is a great way to help your users. Forum is more for building long term interactions. This demands kind of user based few line opinion and topic just closed. Question is specific and answer is custom tailored. If these are allowed on Forums, it will be difficult to moderate. For Q&A site, affect answers should not affect the question, best answer is often vote up/down answer based, who asked can accept an answer as best, question can me marked as duplicate of another, moderation is easier than forum. Which is host is best for cheap cloud server? (Description) I have a WordPress blog with 60K page views per month running on a virtual private server. I am seeking a cloud server for performance for caching. In case of forum we try to understand the case, write a bit longer reply. The matter “cloud server” is towards buzz is made understood, OP can continue discussion. On Question and Answer site, OP can not really continue the discussion. Google dislike Question and Answer sites, but do not dislike Forums. Simply perform web search with the names, you’ll get more details on them and official website. They are quite known. Discourse : Discourse is commonly used now. The person behind is blogger Jeff who is co-founder of Stack Exchange. Phabricator Ponder Application : Ponder of Phabricator is possibly closest to Quora like look. We talked about how to install Phabricator. Slightly difficult to install, demands a subdomain or domain but is PHP-MySQL and does many works. AnswerHub : Answer Hub is Free Part of OSQA, it is written in Python, powered by the Django. Difficult to install by many. Question2Answer : Users can comment, vote, notify, give points and provide rankings, as well. It is easy to install. LampCMS : Another common and easy to install web software. AnsPress – Question and answer : Available on WordPress Plugin repository. UI is like StackExchange. CM Answers : Available on WordPress Plugin repository. UI is like StackExchange. It has a paid upgrade. DW Question & Answer : Available on WordPress Plugin repository. UI is like StackExchange. Discourse or Ponder of Phabricator as standalone softwares. As for WordPress Plugin option, all three we listed are good. There is no reason to web search more. This Article Has Been Shared 4941 Times! Cite this article as: Abhishek Ghosh, "List of Open Source Question and Answer Software," in The Customize Windows, December 3, 2016, April 23, 2019, https://thecustomizewindows.com/2016/12/list-open-source-question-answer-software/.